This is a shot from our summer trip to the Point Defiance Zoo and Aquarium in Tacoma, WA this summer, but somehow it seems seasonally appropriate now. Do you ever visit the zoo in wintertime? Keryn @ Walking on Travels on December 20, 2012 at 5:55 p.m.
Winter is our favorite time to visit the zoo. No summer camps, very few school groups- just us and the animals and the other insane parents with their toddlers out in the rain and cold. eileen @ FamiliesGo! on December 21, 2012 at 7:31 a.m. I've gone to the zoo in winter. No crowds it's true, and good views of the sea lions, polar bears and penguns. But a lot of the other animals are inside away from the cold, so we didn't see much! Terumi on December 21, 2012 at 7:51 a.m. I've always wanted to see a Polar bear swim-you're so lucky. It took me about 5 years to actually see the Grizzlys swim at the Woodland Park Zoo and I go nearly once a week. How on earth did you get this picture? Sonja on December 21, 2012 at 9:56 a.m.
Great pic, especially since I know how hard it is to shoot through glass sometimes. I prefer the zoo in the winter. It seems the summer is always too hot for all the walking and standing and watching done at the zoo. Lisa on December 21, 2012 at 12:15 p.m. 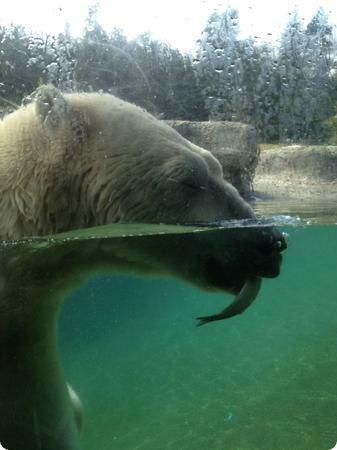 I have never been to our local zoo in the winter (Toronto Zoo) as it's just too cold for me but the polar bears are my favourite animals there. We have been to the San Diego Zoo in the winter and the temperatures there were perfect for zoo visiting.